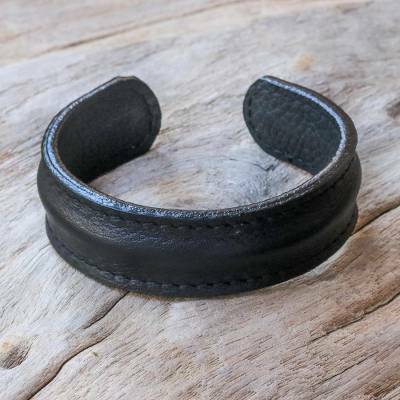 Handcrafted Black Leather Men's Cuff Bracelet from Thailand, "Basic Black"
Crafted by hand, this bracelet by Chaloemphon showcases a subtle texture on supple leather. He creates this black leather cuff for the contemporary man. Stainless steel wire inside the cuff helps you shape it gently to the ideal fit. You can find men's cuff bracelet 'Basic Black' by Chaloemphon in jewelry categories such as No Stone Bracelets, Leather Bracelets and Cuff Bracelets. Enjoy exploring these sections for other Novica treasures. Nice Man's/Unisex bracelet! Perfect Fit, adjusts to fit your wrist, comfortable, and it's just another piece that I will have for years to come! Leather band was made with extreme workmanship; I am extremely happy the purchase.